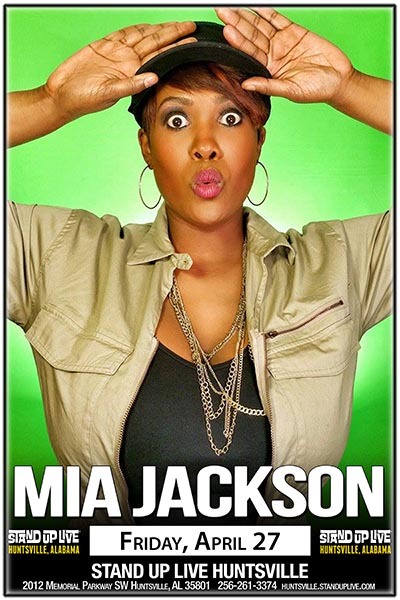 Mia Jackson: Mia Jackson, a native of Columbus, Georgia and a self proclaimed know it all, wondered what would happen if she took her sense of humor to the stage. That’s exactly what she did! After graduating from the University of Georgia she hit the local comedy scene and has thrilled audiences since day one. To her credit she has appeared on Oxygen’s Girls Behaving Badly and TLC’s Wild Weddings. She was also a writer on BET/Centric’s Re-Launch of the Soul Train Awards in 2009 and 2010. In 2012, Mia was a finalist in the Laughing Skull Festival. She recently taped a spot on NickMom's Night Out.